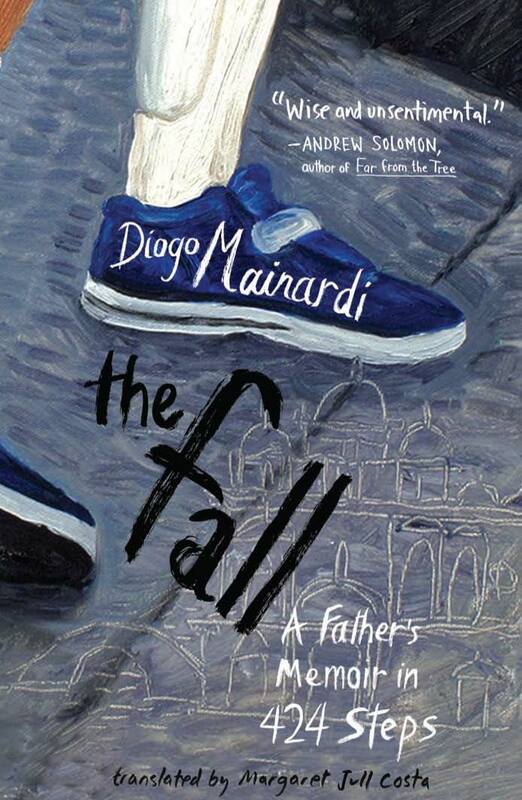 The Fall: A Father’s Memoir in 424 Steps by Diogo Mainardi. Publisher: Other Press [October 7, 2014]. Memoir. Hardcover. 169 pages. This is a love story. A moving, clever memoir about a father’s relationship with his son Tito, born with cerebral palsy. It’s clever because Mainardi writes in 424 steps like the steps that his son has progressively taken over the years as he grows stronger and more confident in his movement. A poet and journalist, Mainardi writes lyrically as well as in a scrupulously researched manner. It’s beautiful and fascinating. At first due to the cerebral palsy, Tito could only manage a few steps without falling down. Thus, The Fall. The memoir chronicles Tito’s therapies and neurologist visits in Boston and New York with meditations on history, architecture and art. Mainardi writes about his current position as a father to a disabled son comparative to Nazi Germany to artists past and current and to the building in Venice where Mainardi’s wife had a disastrous procedure during birth which led to Tito’s cerebral palsy. “A worthless life. Unwertes Leben. A life not worth living. Lebensunwerten Leben. Adolf Hitler’s ‘euthanasia’ program offered ‘mercy killings’ to those whose lives were ‘worthless’ or ‘not worth living.’” In Hitler’s involuntary euthanasia program he exterminated disabled babies as well as disabled adults, the mentally ill, epileptics and alcoholics. “Six hospitals were converted into extermination centers, where the doctors were charged with eliminating patients by injecting them with a mixture of morphine, scopolamine, curare and cyanide.” I’ve yet to see a WWII film about this practice. In the Venice hospital, a doctor gave Mainardi’s wife Anna an unneeded amniotomy. Mainardi explains that in 1756 obstetrician George Macaulay pioneered the amniotomy where the amniotic sac is ruptured in the uterus of a woman giving birth to accelerate the labor. “The biggest danger associated with inappropriate amniotomy is what is called umbilical cord prolapse. That was what happened with Tito. When Dottoressa F ruptured the amniotic sac in Anna’s womb, Tito’s umbilical cord collapsed, thus cutting off his oxygen supply.” Tragic indeed. Tito’s resulting brain damage affected his motor apparatus, causing spasticity. Doctors suggested that Tito needed to live in a warm climate. Mainardi had left his native Brazil at age 24 and never intended to return. But he returned to Rio de Janeiro for his son’s benefit, to improve his son’s health. He writes: “Tito is free. Tito is unimpeded. Tito is naked. Tito is in touch with the sand. Tito is in touch with the earth. Tito is in touch with the water. In Rio de Janeiro, we found everything that the New York neurologist had recommended.” The family remained in Brazil for nine years before returning to Venice. In Venice, Tito is accepted, protected and not an aberration. He walked with a walker to school. And other times he walks with his father. “In the Divine Comedy, Dante Alighieri is always counting the number of steps or paces from one place to the next: There were less than a hundred paces between us. Or: We took ten steps to avoid the sand and the flames. Or: We walked a thousand steps along the solitary path.” Mainardi walks behind his son as they traverse Venice to be the back-up in case he falls. “I counted each step he took, as if I were reciting Dante Alighieri: Uno . . . Due . . . Tre . . . Quattro . . Cinque . . . Sei . . . Sette . . . Otto . . . Nove . . . Diece . . . Undici . . . Dodici . . .Tredici . . . Quattoridi . . . Quindici . . . Sedici . . .” Tito’s progressing in his walks. He walks more and more steps without falling. He has a supportive, caring father who loves him unconditionally. This entry was posted on October 1, 2014, 16:45 and is filed under Books. You can follow any responses to this entry through RSS 2.0. Both comments and pings are currently closed.